Established in 1883, Marfa first served as a water stop and headquarters for the Galveston, Harrisburg and San Antonio railway. According to legend, the wife of a railroad executive suggested the city name from the book she was reading at the time: Fyoder Dostoyvsky’s, The Brothers Karamazof. Marfa was put on the ‘art map’ by the minimalist artist Donald Judd. Before Judd decided in 1971 to move to Marfa as the town offered him enough space to complete his plans for creating a permanent installation of his work, Judd had lived and worked many years in SoHo’s Forged Iron District in New York City. He started buying land in Marfa in order to create an area where he could permanently install his artwork. Marfa became his antidote for the crowded and hectic life in New York City. Donald Judd’s work can be ascribed to the minimalist movement, a movement where artworks are free of emotion, and where artists get rid of the reliance on the self-referential trace in a painting. During his time in Marfa, Donald Judd founded a museum and a center for residencies and research on the land he bought: the Chinati Foundation. The Foundation heads a contemporary art museum based upon the ideas of its founder. Since Judd was the founder of the Chinati Foundation, his works are, together with some other renowned artists, displayed on the Chinati grounds. 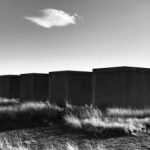 Donald Judd’s 100 untitled works in mill aluminium, and 15 untitled works in concrete are two examples of the legacy that Judd entrusted the Chinati Foundation with. The idea behind the foundation is not only to preserve Judd’s work but preserve and present a permanent large-scale installations by a small number of artists, who show a clear link between the surrounding landscape and the artwork. Similar to the SEA Foundation, the Chinati Foundation has an artist in residence program. Their program was instituted in 1989 with the aim of ‘supporting the development of artists of diverse ages, backgrounds, and disciplines’. Like the SEA Foundation, they focus on artists in all stages of their career and offer a unique location and environment for development. The ‘result’ of each residency depends on the artist. The foundation has no defined expectations. At the end of the residency most artists choose an open studio day or an one-night exhibition to close off the period of time spent there. For this post I talked to Chicago-based painter Magalie Guerin, who has just finished her residency at Chinati Foundation. She stayed at the Chinati Foundation for two months, where she lived on the museum grounds and worked in a studio in the town. As the only artist in residence at the time, she met many people from Marfa and made connections with international people from the art world. Whenever groups of people were getting a tour around the Chinati grounds, Magalie could open her studio doors and show people what she was working on and what the Chinati Foundation offered as a residency. 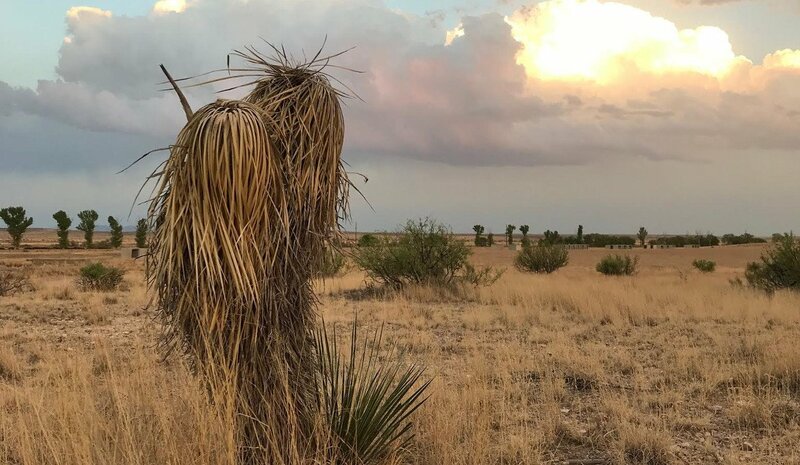 The openness and respect that the art community gave her there made her grateful for the opportunity of this residency and made her fall in love with Marfa. Since she lived on the museum grounds, she had the opportunity to wander around the grounds at sunset and at night, when the museum is closed. The light of the sunset, according to Magalie, could transform installations from a ‘flat’ concrete block into something mesmerizing. Magalie’s enthusiasm on Marfa is unexpected but contagious, as she expresses she mostly lives in big cities and had therefore not expected to fall in love with a little town, but Marfa had a special effect on her. Her always individualistic works suddenly became the ‘Marfa paintings’ and she could wonder in the quietness of the sunset light absorbing the desert surroundings: the landscape, community and connected feeling from the people of Marfa and the sunset light touching upon the art. Next to the Chinati Foundation, Judd also initiated the Donald Judd foundation. All with the intention that after his death in 1994 the Judd Foundation would be there to take care of his legacy. The foundation maintains and preserves Donald Judd’s permanently installed living and working spaces, libraries, and archives in New York and Marfa, Texas. The Foundation promotes a wider understanding of Judd’s artistic legacy by providing access to these spaces and resources and by developing scholarly and educational programs. Where the Chinati Foundation focuses on more artists and residencies, for this foundation the preserving of Donald Judd’s legacy is key. In New York, around the turn of the millennium a new spark of interest was shown in Judd’s work and movement and since within the art world Marfa became a synonym to Judd, the interest in the town of Marfa was created. At the same time the little railroad town seemed, just like it had been for Judd, for many artists an escape from the city life. Since Marfa was then only associated with Judd, the founders of Ballroom Marfa, Virginia Lebermann and Fairfax Dorn saw enough opportunity for more and newer institutions. In 2003 Virginia Lebermann and Fairfax Dorn opened Ballroom Marfa, an old dance hall, which dates back to 1927, that serves as the housing of their gallery. Ballroom Marfa is a non-profit organization and a ‘dynamic, contemporary cultural arts space where varied perspectives and issues are explored through visual arts, film, music, and performance.’ Ballroom Marfa strives to assist artists and curators in projects that are impossible to accomplish within a ‘traditional gallery or museum setting’. An example of an artwork like that is Prada Marfa. The permanent sculpture was opened in 2005 and was created by Michael Elmgreen & Ingar Dragset. The idea was to relocate a luxurious brand like Prada into a remote environment to stress the temporal relevance of fashion, retail as tourism and the consumerist culture. The original idea was to leave the Prada store to nature and whatever happens to it, happens to it. This plan was altered quite rapidly when only a few days after the opening the sculpture was vandalized. Windows were broken, products were stolen and graffiti was left behind on the walls. Then the decision was made to keep Prada Marfa under low maintenance, but since then several times more the artwork was under discussion or heavily vandalised. The artwork really became a tourist attraction when Beyoncé posed before Prada Marfa and sharing the selfie via social media. Though the fans of Beyoncé is not exactly the attention Marfa had hoped for, Marfa still strives for quality within the arts and residencies. Eventually with the goal of becoming a small town known for its great quality in art. Protecting the pureness of art, the mind blowing light and the surroundings, Marfa ignites a spark in the heart of the art lover.